THIS is the moment that a daredevil duo pulled off a flipping awesome show. 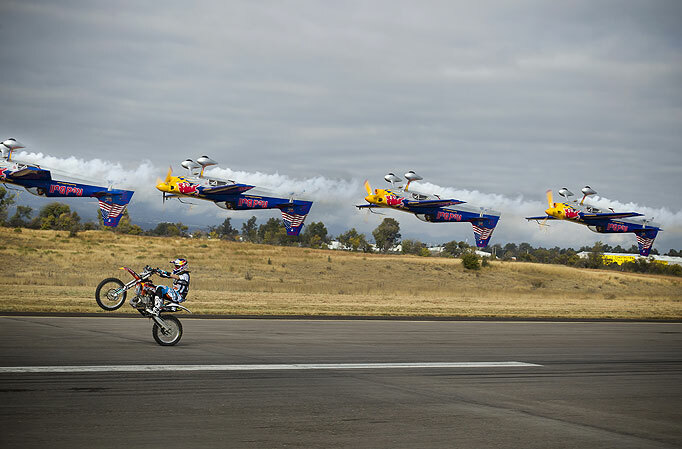 The death-defying stunt saw Petr Pilat, an aerobatic motorbike rider, backflip over a low-flying plane. Petr, 20, from the Czech Republic, teamed up with Kirby Chambliss, a Red Bull champion pilot from Texas, US, to create the incredible double act. 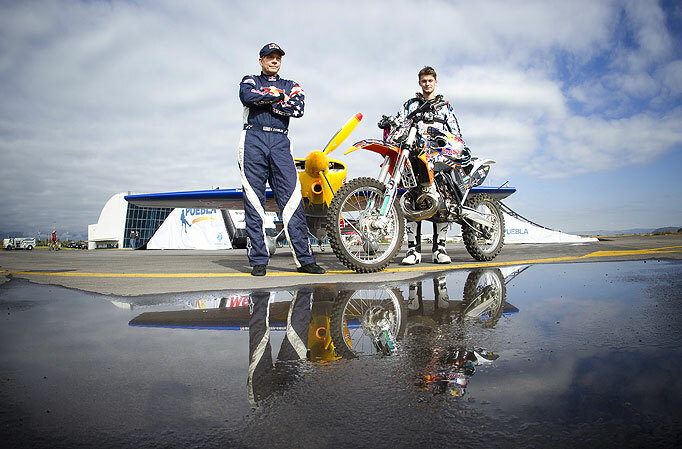 Timing their approach to the split second, Chambliss flew his Zivko Edge 540 aircraft perilously low between two jump ramps — while Pilat hurled his motocross bike over the top. Mexico City photographer Mauricio Ramos, 42, was there to capture the show. He said: "Petr Pilat is a new talented rider and Kirby Chamliss is one of the best aerobatic pilots in the world. "Together they make this incredibly dangerous stunt look like Sunday practice at the park. "Petr had to get his timing right and focus on the backflip – Kirby took care of the rest. "If the airplane flew any higher and been at the same level as the motorcycle the stunt would have been fatal to both. 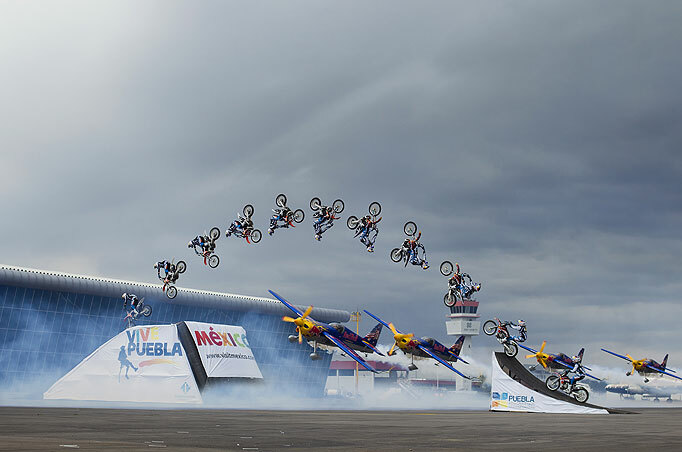 "This kind of stunt doesn’t happen every day and the action was amazing to photograph." 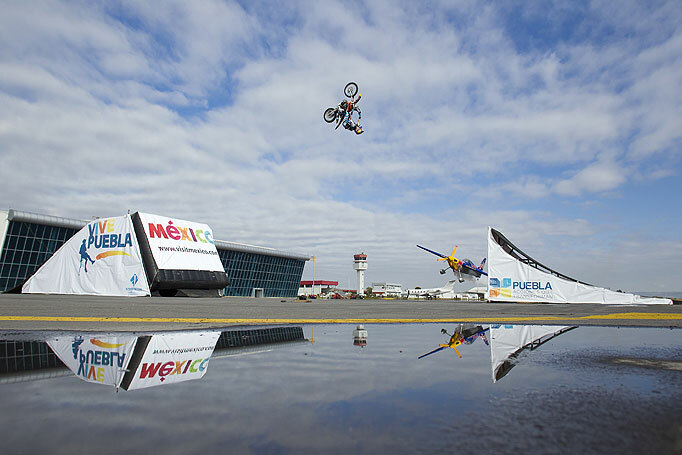 The action unfolded in November in Mexico, and Petr documented the dizzying display in a video. Petr — who was the youngest person ever to do a backflip on a motorbike aged just 14 — said after the stunt: "I’m so happy I’m still alive. "It was really awesome and I’m so happy that we did it."